I love scones… to me, they are like a cross between a muffin and a cookie. They are truly a delectable culinary creation. I tasted my first scone over five years ago at Panera Bread. I ordered it on a whim to accompany a cup of hot tea. The scone was orange flavored and was topped with a lovely glaze. Needless to say I was smitten with them for about a minute… my short lived love affair with this delicious mid-afternoon “snack” ended ubruptly when I realized it was packing almost 500 calories and 20 grams of fat! Once I started my blog, I had every intention of trying to make scones at home, but never got around to it. My perfectionist self also thought I needed a fancy schmancy pan to create nice, perfectly uniform, triangular scones. Then a few weeks ago I was watching Chef Ann Burrell on her Food Network show, Secrets of a Restaurant Chef. I am not a huge fan of this show, but will watch it from time to time. However, her Cherry Almond Scones piqued my interest because she demonstrated how to form the scone dough and cut it into triangles. After watching the episode, I hit up the web in search of a scone recipe that would be perfect for fall. I came across several recipes through yahoo, but ended up settling on a Starbucks Pumpkin Scones copycat recipe. Of course I tweaked the recipe because I apparently cannot leave well enough alone. I did add mini cinnamon chips to the dough which was a scrumptious decision. The end result was terrifically spiced scones full of fall flavors. The texture was amazing and the glaze put them over the top. Do these compare to the Starbucks scones? I honestly have no idea, but I will definitely be trying one to compare the next time I venture into a Starbucks. This recipe definitely ranks up in my top 3 fall favorites and I will certainly be making them again in the very near future. These were so good I ate one for dinner! I hope you enjoy them as much as we did. Looking for more fall recipes? Check out more of my Fall favorites and stay tuned this weekend for a yummy Apple Cinnamon Chip Bundt Cake! 1. Preheat oven to 425°F. Lightly oil a baking sheet or line with parchment paper. 3. In a separate bowl, whisk together pumpkin, half and half, vanilla paste and egg. Fold wet ingredients into dry ingredients and mix in mini cinnamon chips. Form the dough into a ball. 4. Pat out dough onto a lightly floured surface and form it into an 8-inch circle and about 1 inch thick. Use a large knife or a pizza cutter to slice the dough into 8 equal triangular portions. Place on prepared baking sheet. As the plain glaze firms up, make the spiced glaze. 1. Combine the ingredient for the spiced icing together. 2. Drizzle this thicker icing over each scone and allow the icing to dry before serving (at least 1 hour). A squirt bottle works great for this, or you can drizzle with a whisk. These look marvelous. I think I mite try these this weekend. **SIGH** I don't REALLY need to lose weight…. I love making scones. Several recipes on my blog, come visit and have a cuppa with me. I have a friend that makes delicious scones that uses the cinnamon chips and I think hers came out of a Hershey's book. This one looks delicious with the addition of the spices and yummy icing. Oh my goodness yum! 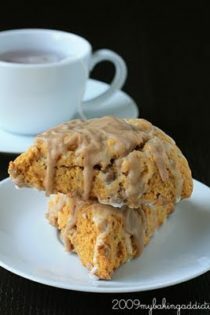 I've been wantint to make cinnamon chip scone but I never thought to add pumpkin as well. That sounds so good! I love scones too and these sound great. I love Panera Bread! I love scones I'm with you on needing a fancy schmancy pan until I watched Barefoot Contessa. She made it look so easy and guess what….it was! I made vanilla scones and they turned out amazing. Starbucks makes a petite vanilla scone they are so tiny and cute! 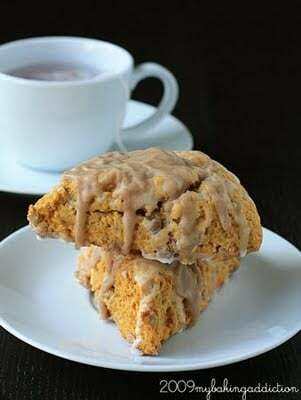 I must say your pumpkin cinnamon chip scones look amazing! It's that time of year for pumpkin!! These look wonderful! I love scones too. Great addition with the cinnamon chips. I would love to wake up to one of these tomorrow – yum! I still can't find the cinnamon chips though. These look to die for! I haven't been able to find cinnamon chips in store, and all the ones online seem to be processed with peanuts (my son is severely allergic)…bummer! I'm not a fan of Panera Bread, their sammies are so expensive for the size. They do have good sourdough bread though. But these scones that you made are HEAVENLY. I love a good scone with tasty glaze. Really nice. I made these yesterday (although I used dried cranberries instead of cinnamon chips, since I didn't have the chips on hand). They were so good! Such a nice pumpkin flavor, moist, and not at all heavy–the perfect Sunday morning scone. Your scones look so perfect for Fall! I am obsessed with everything pumpkin, just can't get enough at this time of year. I also love scones! They're so simple to throw together, yet sound so sophisticated when served alongside a lovely box of teas. My favorite is a white chocolate cranberry (Craisin) scone. Mmm! I'll try again tomorrow if i have time. I’ve made these twice before and they’ve been amazing each time. Just tripled the recipe and it turned out 32 scones for a big Thanksgiving feast tomorrow. All I changed was adding ground cloves to the scones and glaze. Thanks so much for the amazing recipe! I didn’t use eggs in mine – so the scones were more traditional – super moist, light, fluffy, flaky, and buttery! I must try it with pumpkin next! The best scone I ever made.. Thank you.. will try different ones with orange zest, dried cranberries, and white chocolate.